Deathwing's powers of destruction are so strong that Everquest II might also see its world completely changed. Blizzard's ballsy move to completely change the landscape of the World of Warcraft in December 7's Cataclysm expansion pack could be a concept that makes its way over to Sony's Everquest series. 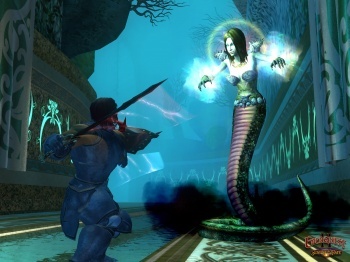 President of Sony Online Entertainment John Smedley told Kotaku that the company is considering a world reboot of its own for Everquest II. Smedley says that SOE has been looking at the idea of a similar change to Everquest II "closely ... for a number of years now." He doesn't think a cataclysm will come to the MMO in its next expansion or anything, but he admits that the idea is "interesting." One of the more compelling aspects of Blizzard's change to World of Warcraft is that the world will apparently never go back to what it once was. Content that gamers have played through for years will no longer exist, ever. Smedley compares this to the use of a "reset button." He feels that resetting an MMO's world is risky, but says Blizzard is lucky in that it has the "goods" to take a chance on a concept like Cataclysm. It could potentially bring even more gamers into World of Warcraft, but Sony hopes to bring some of those new gamers over to Everquest II as well. One particular way to do this might be by destroying Everquest's world just like Blizzard recently did. Smedley adds that Sony has been "reluctant" to take a risk as big as Blizzard's Cataclysm, because it could presumably alienate Everquest II's loyal user base. Sony has found that Everquest II players typically don't play World of Warcraft, with past Blizzard expansions only causing a "tiny drop" in Sony's numbers for a while. Destroying everything those players know might cause a much bigger drop, or it could bring even more players in. Both titles came out in November 2004, so a Cataclysm might be just what Everquest needs too.